This post demonstrates the installation and configuration of jboss AS 7.1.1 on CentOS 6.4. There are many articles/posts all over the internet regarding jboss installation for both domain and standalone mode. But, i have tried to make this one more illustrative and accurate than any of them. Make sure the iptables are flushed. Make sure selinux is in disabled mode. Setting up Jboss requires jdk to be installed. I am using jdk-7u60 for the configuration. Download jdk-7u60-linux-x64.rpm from here. In case you want to check running the jboss in domain mode, just unzip the above package and execute the domain.sh file. In this section we'll setup both master and slave for them to run in domain mode. And we will configure master to be the domain controller. We need to change the address to the management interface with that of master's ip address so slave can connect to master. Similarly, change the ip address for other interfaces as well. The public interface allows the application to be accessed by non-local HTTP, and the unsecured interface allows remote RMI access. Replace 127.0.0.1 with ip address of the slave. Because we haven't properly set up the authentication between master and slave. Now let's work on it. We will use this user “slave” for slave AS7.1.1 host to connect to master. That also means that for each additional host you need a user. By default, there are 3 servers listed in host.xml. We modify the host.xml for both master & slave according to our purpose. There is port-offset defined by default but we need to run both servers on 80, so we remove that part from host configurations. To open jboss on port 80 instead of 8080, change the port 8080 in the socket-binding-group being used while defining the server-groups. Also, we modify domain.xml as per our requirement. This will be done in case of master only, as slave won't have domain.xml file. Note that, we use the ha profile here and make sure we use the same profile for any configuration changes, whenever we do. The database we are using is mysql and mysql jdbc driver version is 5.1.15. The following changes are to be made in the domain.xml file of the master server. To make the JDBC driver classes available to the JBoss Application Server, copy the archive mysql-connector-java-5.1.5-bin.jar to jboss-7.1.1/modules/com/mysql/main/ along with module.xml. The datasource configuration can be done from admin console as well. 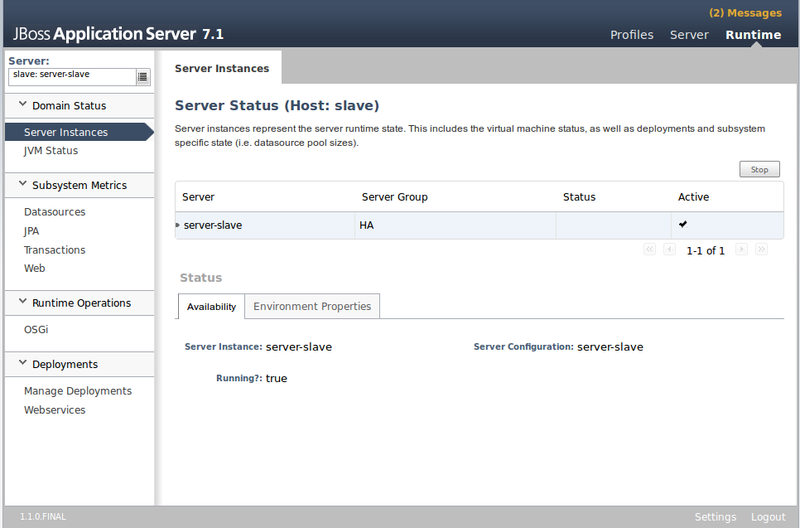 There is no datasource configuration required to be done on the slave host. Now, we are done with the jboss master-slave cluster configuration in domain mode. If every thing goes as expected, you will have your jboss cluster up & running. To start the servers, we will use the domain.sh scripts on both master & slave servers. Start the master server and then the slave server, which then registers itself to the master server. Now, if any war/ear deployment file is deployed on master server, which is also the domain controller here, the file is deployed on the connected slave server automatically. It takes 3-4 minutes depending on the content and size of the deployment file. There is no other additional changes required in the deployment file to enable the session replication, jboss is smart enough to handle rest of the functionalities. Now, once domain.sh scripts are finished running on both master & slave, you will have the below admin console appearing on the domain controller. By default, jboss runs on port 8080 but as we have redirected it to port 80, we can simply open it by hitting the server ip from the browser. Now, war/ear files can be deployed from the Deployments>Manage Deployments section as you can see above.